It's that time of year again, running around trying to get the perfect gifts for all the loved ones in our lives. But the truth is, it can be hard to know what to get those who have specific interests, activities, and hobbies. 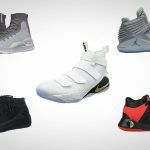 For the hoops addict in your life this can create a situation where finding something they actually want or will use may become a challenge, especially if you do not follow the game of basketball. Are you in this situation? 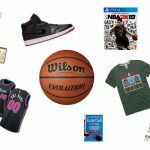 If so, you are in luck, because like that hoops maniac in your life, we are obsessed with the game and have created a list of the 20 must-have basketball gifts this holiday season. And once you've found the perfect gift for the hooper in your life, maybe you could pick up something for the BestOutdoorBasketball team (we've been good this year!). Back in day NBA Jam was the hottest hoops game in all the land. Catch phrases like "boom shakalaka" and "he's on fire" became a part of popular culture in part thanks to this game. Thanks to the creative team at Homage, now you can rep your favorite current NBA duos in the style of the menu from NBA Jam - Tournament Edition. On top of the great styling, Homage makes some of the most soft and comfortable t-shirts on the planet. What better gift could you give the hooper in your life than instructional lessons from one of the best players in the game. 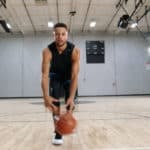 In this basketball course from Masterclass Stephen Curry breaks down shooting, dribbling, coming off screens, and everything in between, from the basics to advanced. Students will get access to an exclusive forum, drills developed by Curry himself, and can even ask Stephen questions thanks to the "Office Hours" feature. Every basketball player needs a premium indoor only basketball that will allow them to work on their game without worrying about the performance of their ball. Simply put, there is no better indoor basketball than the Wilson Evolution. We've tested them, so we should know. This basketball is responsive, consistent, and made with quality materials. The person who receives this from Santa will be a happy hooper. Books are a great gift for anyone, basketball players included. Basketball: A Love Story is perfect for hoops historians who enjoy learning the history of the game as much as they enjoy playing it. This book dives deep into well-known and obscure events from the game of basketball to give greater understanding to how the game has changed lives and the world as a whole. Inspired by the ESPN series, Basketball: A Love Story is an interesting read for any basketball enthusiast. I can remember going to the arcade as a kid, and trying like hell to best the top score on the pop-a-shot game. Now you can bring the quality of the Pop-A-Shot Basketball Arcade to your home. With 10 different game-modes, Pop-A-Shot offers hours of entertainment. Some quality features found on the Pop-A-Shot Dual Shot Arcade include: infrared scoring sensors, LED scoring display, and quality rims. Simply put, there is no better home basketball arcade than the Pop-A-Shot Dual Shot. I own one, and use it regularly. There is no more iconic sneaker line than the Air Jordan. And of the now 33 incarnations of this shoe, none may be as timeless as the very first. While these are no longer up to par in terms of performance compared to what is found on modern basketball sneakers, the Air Jordan 1 is perfect for those who want to rep their love of the GOAT off the court. I recommend the SE line of the Air Jordan 1 due to the unique colorways that you can't find on the standard AJ. We can't all play in the NBA (I know, it's not fair). But for us mere mortals it can still be fun to pretend to be our favorite high flyer. Thanks to NBA 2K19 you can bring those dreams into the realm of reality, virtual reality that is. With NBA 2K19 you won't just live the life of your heroes on the court, but you can put in the time out of the arena to become the best through the My Career mode. At BestOutdoorBasketball.net, I've been reviewing portable basketball hoops for several years, and none as brought as many innovations to the table as the Silverback NXT. This hoop has several design improvements when you compare it to other portable units. It starts with the simplified assembly, which can take as little as 90 minutes! This is music to the ears of anyone who has spent countless hours of frustration trying to assemble a hoop. On top of that, the infinity edge backboard is lightweight and sturdy, not to mention it looks great. Not every fan of basketball spends their time actually playing the game. The masters of the game are usually found in a suit on the bench barking orders to the players. These coaches' playing days may be over, but their mind for the game is sharper than ever. For the coach in your life, upgrading their clipboard will allow them to get their vision across to players better so that the execution on the court will be crisp and effective. As a basketball player, when I first step into the gym I'm often cold and a bit stiff. To get warmed up, it's nice to start stretching, dribbling, and shooting close to the hoop to help my muscles and tendons loosens up a bit. This process can be enhanced by a premium quality hoodie by warming you up faster and allowing you to get game-ready faster. The Nike Showtime F/Z Hoodie is the perfect warmup hoodie for any baller that is looking to speed up their warm-up so they can spend more time playing the game. For any basketball player that hasn't down so, one of the most common dreams we have is to throw down a monstrous dunk in front a ruckus crowd. The truth is, if you want to be able to dunk it takes a lot of hard work and dedication to build the strength and explosiveness needed to complete such a task. Thankfully, Adam Folker and the Vert Shock team have created an easy to follow program that will add 8+ inches to your vertical. That may not result in the basketball player in your life dunking, but it will no doubt make them a more explosive and effective basketball player. King James is one of the greatest basketball players of all time, and as a resident of Ohio, I can attest to the high esteem that Lebron is held by many. With his long-term partnership with Nike comes the Lebron 16, which may be the best Lebron James basketball shoe ever. The shoe features several pockets of uncrated zoom air making for a super comfortable ride. One the back of the shoe is my personal favorite feature, an image of a lion with red eyes staring at you. If that doesn't scare the competition then I don't know what will. Some of the biggest fans of basketball are not kids, but adults with successful careers. Why not add a little classy sign of fandom with these dope NBA cufflinks? These cufflinks feature a silver-plated face and are available in all 30 team logos. Maybe these cufflinks will convince him to stop wearing that ugly Space Jam Tie...maybe. Developing a love for the game of basketball starts at an early age. Introducing the game with a toddler basketball hoop is a great way to have fun with your little ones, and show them why this is the best sport on earth. I highly recommend the Little Tikes Adjust N' Jam hoop for families with toddlers looking for a small hoop to get started with. I like this hoop because its height can be adjusted so that it can grow along side your little hooper. One of the more unique basketball-related gifts you could give is a personalized shout-out from a current or former NBA/WNBA basketball player. 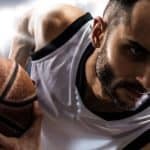 To use Cameo you simply select the basketball player you want to give the shout-out, make a reservation, and pay. Then, on the due date you'll get your personalized message from a professional hooper. Currently, you can get shout-outs from Brian Scalabrine, Bill Wennington, Ron Baker, Ryan Arcidiacono, Will Perdue, Sam Dekker, Channing Frye, Crissa Jackson, Thomas Bryant, Rudy Gay, Glen Davis, among others. Okay, so not exactly all-star caliber basketball stars, but still it is still a pretty cool gift. In my day, it seemed like everyone had a Michael Jordan jersey that they wore to school. For all others who were kids in the 90's, I'm guessing you had a similar experience. These days not only can you get jerseys of a bunch different players, you can also customize your jersey to have it say what you want on the back. Not only that but the NBA now has a lot more alternate a special jerseys that they release throughout the season, such as these badass "Miami Vice" Heat jerseys. Seriously Miami, throw out the boring colors you currently suit up in and rep these full-time. I can't remember a time where the NBA has been more exciting than it is now. There are so many talented stars ranging from the seemingly unstoppable forces like Lebron and Giannis, to skillful masters such as Curry and Irving. What better gift to give an NBA addict than a season's worth of NBA action in the comfort of their home? I personally can't think of anything. What separates the NBA superstars from the promising young prospects that end up relegated to draft bust status? Each group is freakishly athletic and can seemingly complete any move or shot on the court. They both have coaches and scouts drooling, but one ends up an NBA All-Star and the other out of the league in four years. The difference is what's going on internally, in the mind. Successful athletes are resilient, mentally tough, and are driven to achieve new levels of skill. At the same time they are mindful and utilize they're failures as a catalyst to future success. "The Champion's Mind" by Jim Afremow, Ph. D. will give you the secrets that will make your hooper mentally tough on the court. While dribbling and shooting are important, developing mental toughness creates success on and off the court. While it is easy for young basketball players to become obsessed with one aspect of the game, like dunking or pulling off that fancy dribbling move, it is much more advantageous to spend time building a solid foundation to their game. "How To Be Better At Basketball In 21 Days" is a book written by James Wilson with an emphasis on how to develop fundamental basketball skills efficiently as possible. Mr. Wilson is a certified personal trainer and has spent 30 years developing young hoopers. This book breaks down everything from the triple threat position to conditioning. It used to be that the shoes you wore on the court was what set you apart from other players. These days you have a lot more to choose from including head bands, arm sleeves, and unique socks like these tile socks from Stance. 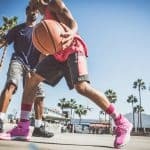 With a psychedelic twist to the basketball shoes, Stance has developed some of the funnest and most unique socks on the planet. Give your baller some personality in their gear.